Happiness is the Road is the fifteenth studio album from England’s most beloved melodic progressive rock band, Marillion. With a sound far too enlightened for American radio, the band nevertheless manages to sell out all of its shows on the rare occasion that they hop across the ocean to play our major cities. Of course like all the finest musical artists (i.e. the ones whose music can’t be covered by your average high school garage band), they have a huge following throughout Europe — no surprise to our European readers. If you haven’t yet become a disciple of the Marillion gospel, such a lengthy career can make it hard to figure out just where to get started. While the band’s 2007 effort, Somewhere Else, wouldn’t have been the right place to jump in and get your feet wet, the late-2008 double-CD Happiness, half of which is a concept album and the other half just a collection of random songs, provides a great swimming pool in which to immerse yourself. The style of melodic progressive rock presented combines much of the current Marillion sound with some obvious influences from a period often regarded as providing some of the band’s most memorable music. Of course for us to tell you which period that is would invite a wide range of debates and heated arguments, so we’ll just leave it at that! It’s hard to speak of the world’s most successful independent band without a reference to their pioneering use of the Internet as a medium for connecting with their fans worldwide, but since we already explored this topic in our previous Marillion feature, we’ll just ask you to read that feature to learn more about why this is one band every serious musician should know (not to mention music fans in general who appreciate expert musicianship, intriguing storytelling, and emotive vocal delivery). 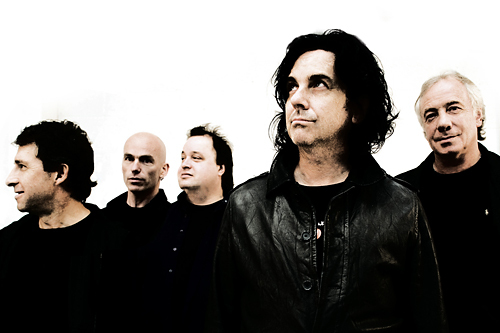 We caught up with the two Steves — vocalist Steve Hogarth and guitarist Steve Rothery, to talk about the new record. H (as he is often called) spoke more about the meaning of the songs and the album in general (you know how those singers are), while we talked shop (toys, toys, toys!) with our fellow gear-lover Rothery. If you haven’t listened to Happiness is the Road yet, you can read our album review here.